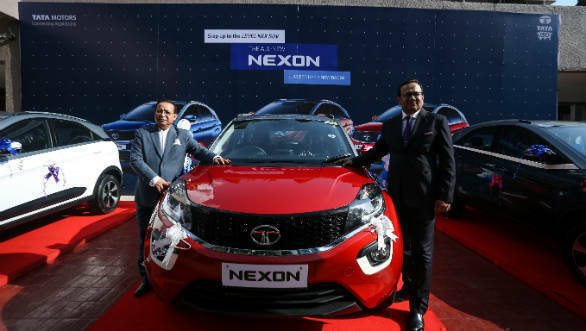 After enjoying a good run in India, Tata Motors has announced the launch of the Tata Nexon SUV in Bangladesh. The compact SUV will be sold in the country through its local distributor, Nitol Motors. The Nexon will be available in the country in the top-spec XZA+ trim-level in both petrol and diesel engine options. Six colour options will be available to buyers - Etna Orange, Vermont Red, Moroccan Blue, Seattle Silver, Glasgow Grey, and Calgary White. Prices are BDT 24.9 lakh for the petrol and BDT 25.9 lakh for the diesel. Notable features include dual-tone roof, alloy wheels, daytime running lamps (DRLs), 60:40 split-folding rear seats, a smart-key push start button, electrically foldable ORVMs, park assist with rear sensors and a reverse camera, a 6.5-inch touchscreen infotainment system with an 8-speaker set from Harman and a height-adjustable driver seat. Other features include automatic climate control with rear vents, cooled glove box and an USB fast charger. Safety features like dual airbags, ABS with EBD are standard across all variants. The Tata Nexon's 1198cc, three-cylinder petrol motor puts out 110PS and 170Nm while the 1498cc, four-cylinder diesel engine is rated at 110PS and 260Nm. The AMT gearbox offered is a six-speed unit.